Harry’s walks are still on the lead and short, to allow whatever is causing his lameness to recover. 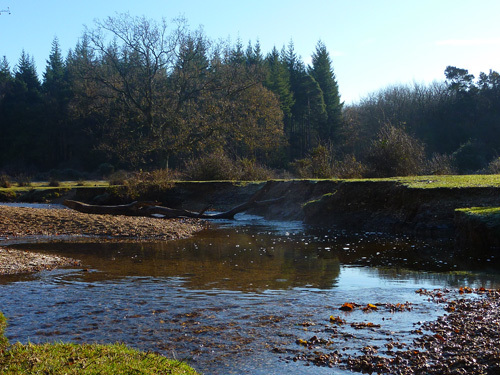 We head to Linford Bottom, close to home and with a wonderful variety of walks to take from it’s car park. Another fine, bright and frosty morning. 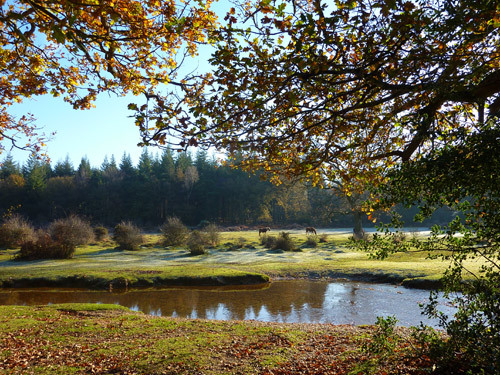 Setting out the view across the brook is sunny with just a little lingering mist in the air. 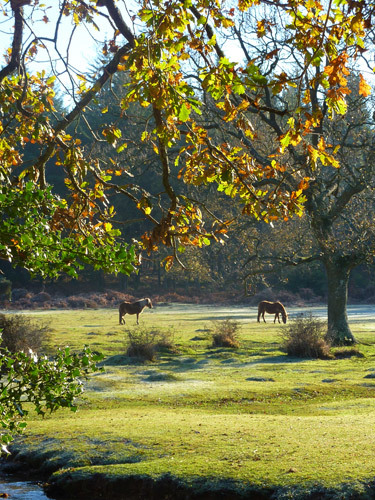 Ponies graze on the lawn in front of Little Linford Inclosure, the receding frost allowing them to find already close cropped grass. 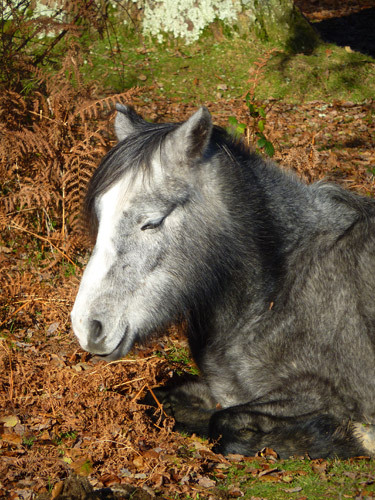 One of my favourite locals catches 40 winks in the morning sun. 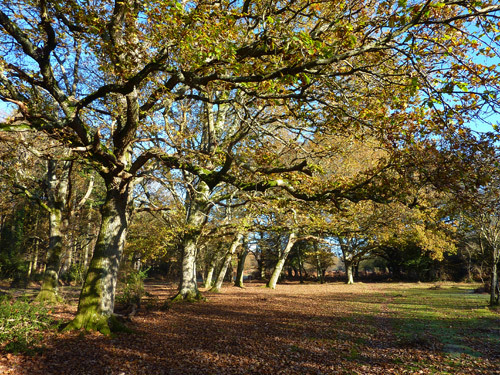 A fine avenue of oak trees. 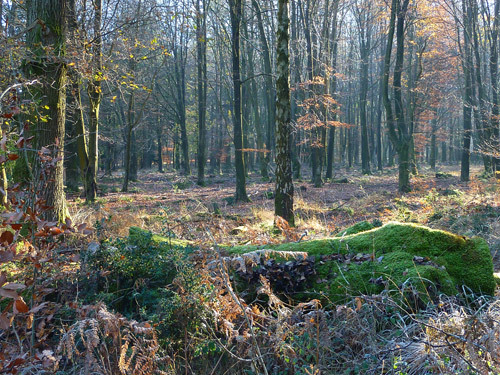 Across the brook and heading towards Pinnick Wood, this panorama seems to me to depict the change from autumn into winter in one shot as the sun drenched woodland gives way to areas that the sun cannot reach. Zooming in on the frosty area leaves a wintry scene. 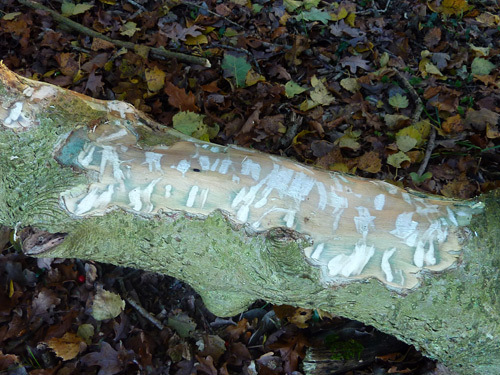 Just within Pinnick Wood, a fallen branch shows recent signs of deer rubbing their antlers. A few yards away, much older evidence of the same activity. 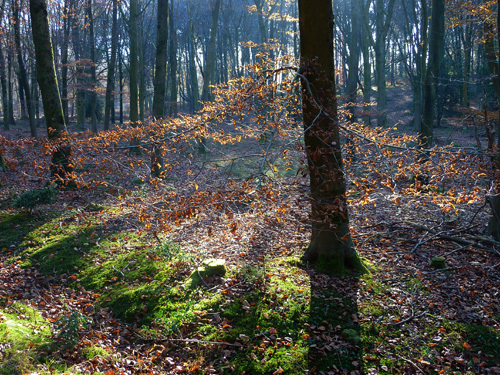 Into Little Linford Inclosure now, young beech trees in the misty sunlight. 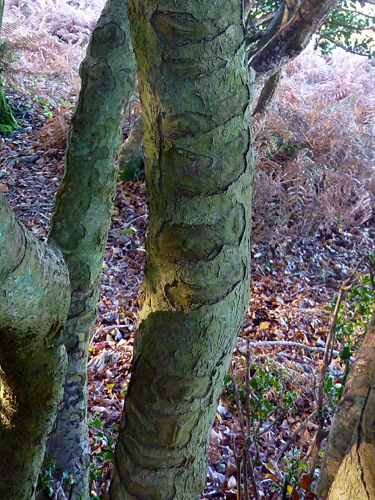 A panoramic shot of the straight dark trunks against the bronzed undergrowth. 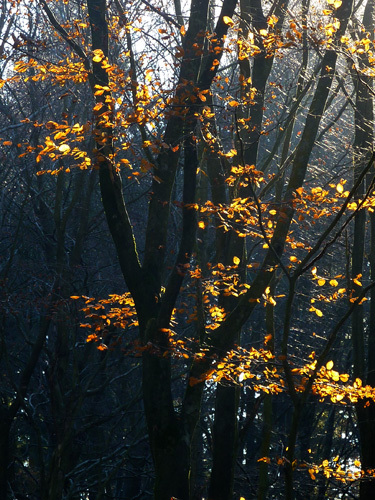 …but catch the sun behind and they still light up. 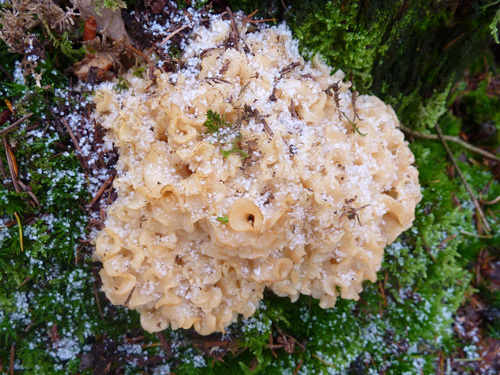 Fungi still abounds, Sparassis Crispa, found at the base of a long cut down pine tree and covered in frost. 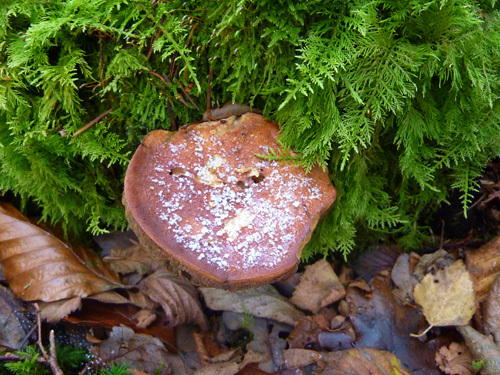 A bolete of some type, in amongst fronds of moss. 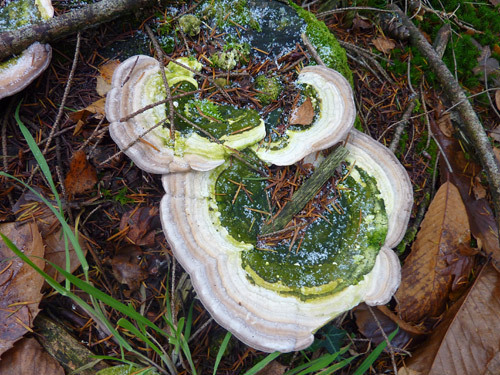 Many Zoned Polypores, I think with algae growth in the centres. 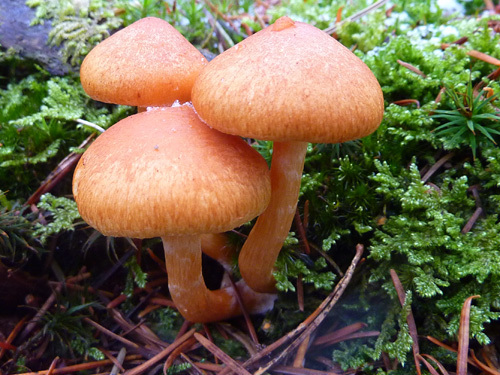 This one I don’t know the name of, but it’s very pretty. 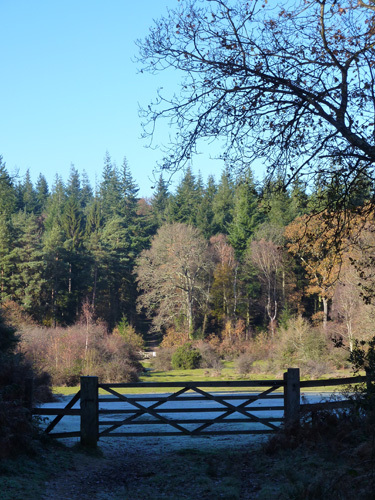 Looking out of Little Linford Inclosure towards Great Linford Inclosure opposite. 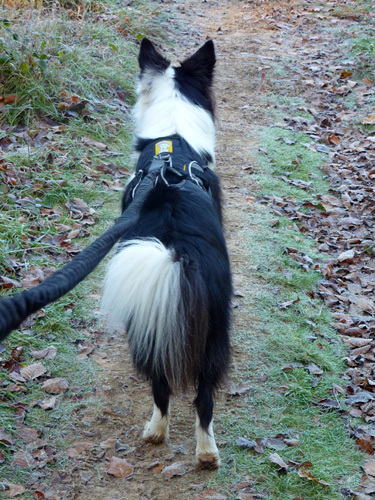 Harry, still on the dreaded lead, looks ahead as we leave the inclosure and head towards the car park.